Innovation creates new demand and enhances productivity, which promote sustainable growth and development in Japan. NISTEP has a mission of providing objective evidences to promote science, technology and innovation policies. In this regard, NISTEP investigates and analyses the state and trends of innovation and innovation activities in firms to better understand national innovation system of Japan. The fifth Science and Technology Basic Plan states that evidence-based policy planning, evaluation, and execution STI (science, technology, and innovation) should be promoted to strengthen those functions. NISTEP investigates the state and trends of innovation and innovation activities in firms by following the international guidelines of collecting and interpreting data. NISTEP also constructs unique data, which combines institutional level data with bibliographic information, and analyses the economic impacts of knowledge flows through academia into industry. These research projects will contribute to better understand innovation system and innovation processes as the subjects of or backgrounds to STI policies as well as improving innovation measurements. The Japanese National Innovation Survey (J-NIS) is an official statistical survey on innovation and innovation activities in enterprises. The survey results are used as basic information for analysis, planning, execution, and monitoring of STI policies. The J-NIS follows the Oslo Manual, which is the guidelines for collecting and interpreting innovation data developed jointly by OECD and Eurostat, and uses a survey methodology, including a questionnaire, that can secure the international comparability of results. Those survey data are also used for indicators and reports published by international organisations, such as OECD, and empirical analyses. On 27 February 2017, NISTEP held an international seminar entitled “A New Development in Innovation Surveys: Measurement to Inform Policy Making” in Tokyo. Prof. John Walsh (Georgia Institute of Technology) and Dr. Christian Rammer (ZEW), leading scholars in the field of innovation studies, were invited as speakers. This seminar aimed at learning from newly developed experiences in innovation surveys in different countries with a view to making use of them more widely in future. The process of innovation consists of mutual interaction among private companies (who are the central actors in the process) , the government, universities, and public research institutions. 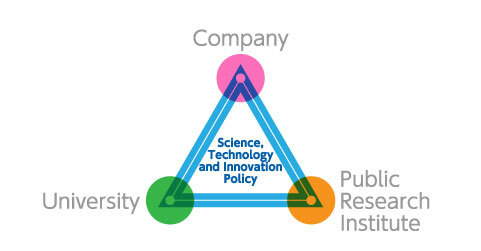 Thus, when formulating and implementing S&T policy from the standpoint of creating innovation, it is important to appropriately ascertain the R&D activities and management trends of not only the government, universities, and public research institutions but also private companies, which bear approximately 70% of Japan’s total R&D expenditure. In FY1968, the then-Science and Technology Agency began conducting the “Survey on Research Activities of Private Corporations” as an approved statistical survey of the Ministry of Internal Affairs and Communications to grasp research trends in private companies. The survey has been conducted almost every year subsequently. Responsibility for its implementation was passed to NISTEP beginning with the FY2008 survey. It is currently the only survey of R&D activity in private companies that is conducted continually and on a large-scale basis. NISTEP also conducts surveys on international development of R&D activities by private companies, surveys and research that focus on industry-academia collaboration and intellectual property management, and surveys on research management by universities and public research institutions. NISTEP conducts the general statistical survey “Survey on Research Activities of Private Corporations” each year. The survey targets approximately 3,500 companies that engage in R&D activities and have at least 100 million yen in capital. NISTEP manages a database on industry-academia collaboration and analyzes industry-academia collaborative activities using this database in order to get a picture of the actual status of such collaboration, which has been promoted through measures of the central government and others since the mid-1990s. NISTEP studies methods that use intellectual property rights as an indicator of R&D achievement as well as on the ideal forms of intellectual property systems and management that encourage innovation. Given advancing internationalization in private-sector R&D, NISTEP conducts surveys on the status of R&D internationalization, specific initiatives taken by local subsidiaries, and R&D cooperation with overseas interests in order to get a picture of realities in this area. NISTEP conducts surveys and research that focus on management of universities and public research institutions, which are the main actors in the national innovation system. NISTEP implements surveys and research on laboratory management at public testing institutes and surveys of management systems at universities that are among the world’s leading research bases. NISTEP studies and analyzes the influences that private companies’ non-R&D activities have on innovation.